Sweet City focuses on supporting of opinion expression and communication in Swedish in various situations. The game is a motivating and flexible study material that can be played on computers or tablets in school. 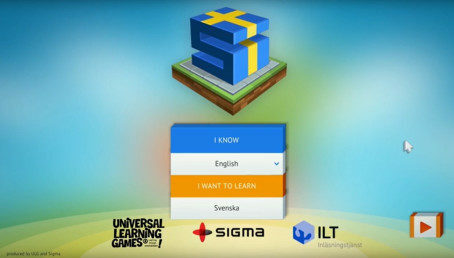 The game is launched by Inläsningstjänst (ILT), one of the biggest actors providing different tools for immigrants through their service “Studiestöd på modersmål” (Study support for immigrant students in their mother tongue). Universal Learning Games (ULG) company was responsible for pedagogics and concept, while Sigma provided all the software development and design. Sweet City is an innovative product that follows the curriculum of SVA and combines modern methods of language learning, EduGame techniques, and modern science. Sigma and Universal Learning Games have previously produced the English Minnits game, which is today played internationally by 20,000 students. This game was developed with support from the National Agency for Special Needs Education and Schools of Sweden and is applicable for learning English in grades 4-6. ULG is planning to launch the next product in the Minnits series in 2017 with the focus on mathematics. For more information about our Swedish language meetings for foreign engineers, please visit https://sigmatechnology.se/events/swedish-language-sessions-for-engineers/.